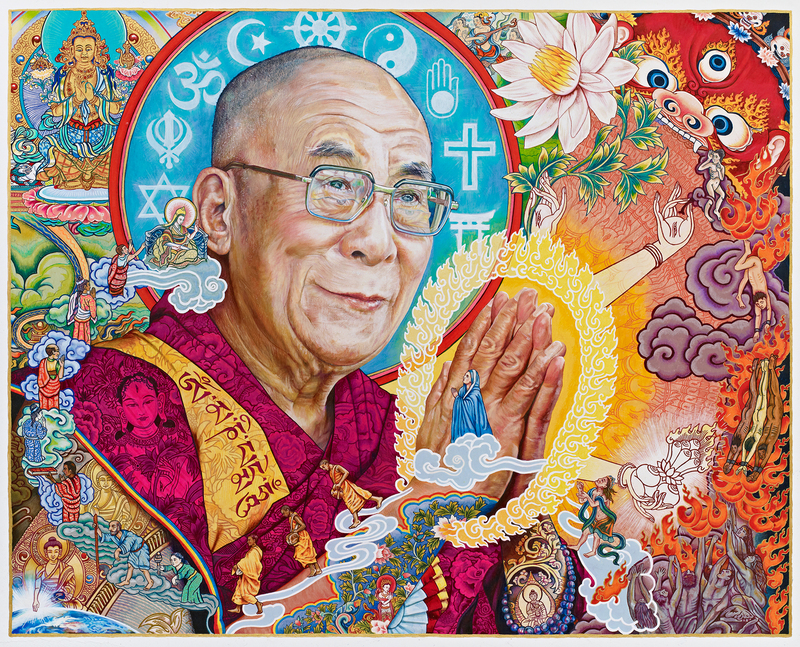 I had the incredible honor of being asked to do a portrait of His Holiness the XIV Dalai Lama for his 80th birthday. Given this benediction and blessing I knew I would meet the task by rendering more than just his facial features. So instead, I decided to attempt to draw a portrait of his heart. It would illustrate the Buddhist wisdom and philosophy he carried with such fierce non-attachment, an ocean of peace pouring out of him with 10,000 compassionate arms, his love of all religions and his hope for their harmony, his prayerful be-speckled, smiling bow to humanity exactly as it is and exactly as he knows it could be. This is that portrait and my grateful bow back to this man’s heart. 2016 mixed media on paper. For inquiries on obtaining a print of this piece, please message me via the Contact Page. Thank You!